Luxe boutiques and galleries have lined Soho’s West Broadway for decades. The blight started in the 1830s, when expensive brothels moved into former residences, writes Timothy J. Gilfoyle in City of Eros. That auspicious name turned into a citywide joke. 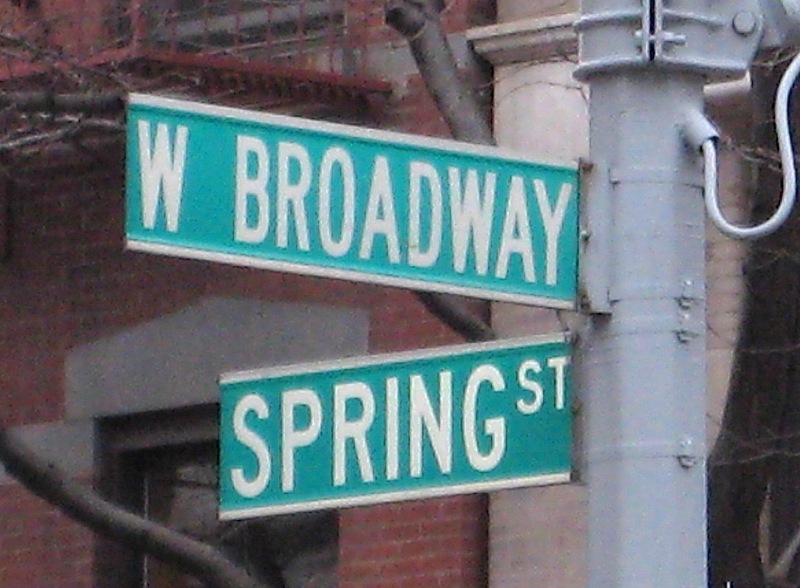 Mayor William Strong’s administration changed the moniker to West Broadway in 1896, which stuck. Here’s the corner of Canal and West Broadway in a NYPL photo from 1936, looking much more like the West Broadway we know today. This entry was posted on March 16, 2011 at 12:11 am and is filed under Politics, SoHo. You can follow any responses to this entry through the RSS 2.0 feed. You can leave a response, or trackback from your own site. William Strong was Mayor in the 1890s. William O’Dwyer was Mayor in 1947. Thanks, the named changed to WB in 1896. I’ll fix. Things may have gotten figuratively dark and dirty by the 1870s, but shortly thereafter came the real thing. It couldn’t have done a lot for West Broadway’s self-esteem to languish under the shadows of the Sixth Ave el. From Murray Street, where it crossed from Church, north to W 3rd St, where it crossed to Sixth Ave, the el ran its entire length. Note that LaGuardia Place – a change that took – did not supersede on the stretch north from Houston St until long after the el was dismantled. For 60-plus years, starting in the late 1870s, only bits were exposed to the sun: the jog from Vesey to Murray, and the stub from W 3rd to Washington Square. Until 1903 it was the Age of Steam, as trains were pulled by locomotives. Perhaps they looked mighty cute in a distant valley, but it probably didn’t seem a bit romantic when they went thundering right by your windows. The elevated and the mark that it made upon the streets where it ran is an all-but-forgotten chapter in our history. We’re grateful that you’re helping us to see better what has vanished. [You may drop this paragraph when you’ve made the correction. You are right, 1939. I was clearly not at the top of my game when I posted this last night! Thanks for the el info. Imagine all those city streets, rattling and choking in grime from the locomotives. I lived at 46 Grand Street (between West Broadway and Thompson) from July 1975 until October 1987. I became friends with an old man who was born in March of 1891 on Thompson Street between Broome and Grand. He was a newsboy at the turn of the century and sold newspapers for 2 cents each at the foot of the stairs of the elevated railway there. He told me many stories about the neighborhood including often seeing Teddy Roosevelt stop by the drugstore on the northeast corner of Thompson and Grand to visit his druggist friend. Roosevelt was police commissioner at the time. My friend lived in a small apartment with his wife and child from 1932 until around 1988. He died at 100. There was actually a proposal to rename West Broadway “Jackson Pollock Place” in the 1970s (http://sohomemory.com/2011/02/05/meet-me-on-the-corner-of-pollock-and-de-kooning/). My mother and grandparents lived on (?) 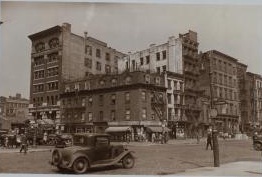 W. Broadway from about 1928 til ’34, when they moved up to w. 58th. My grandfather and his family had immigrated from Austria Hungary (Czechoslovakia) in about 1910, and moved out to farm country in central PA. After a number of menial jobs, caretakers, housekeepers, in NY, my grandparents started up an auto and truck mechanic shop on Hudson street. They operated M&F Automotive til the ’70’s when his son took it over. Thanks for your interesting blog.